The UK was always going to stay in a customs union with the EU the moment that the EU put the Irish border as one of the three items to be settled at the first stage of negotiations. The logic is straightforward. Putting it at the first stage meant that the EU would not sign any trade agreement which resulted in a hard border. To avoid a hard border Northern Ireland has to be in a customs union with the EU and in the Single Market for goods. There is no wish in the UK to have a sea border between Northern Ireland and the rest of the UK. Parliament will not allow a No Deal Brexit. So any deal will have to involve the UK being in the Customs Union. It is clear that Theresa May will try and avoid that logic for as long as possible because she wants to keep the Brexiters on board. She hopes she can do so until we have formally left the EU. That was always going to be very difficult, but Labour have now added an additional hurdle: parliament could vote to stay in a customs union before 2019. I will leave it to others better qualified than I am to work out whether that will happen, and what the consequences of that would be. I just want to make two points: one for Remainers and one for Lexiters. It has frequently been suggested by some Remainers that Corbyn is an entrenched Lexiter and as a result that he would never allow Labour to stay in the Customs Union. Too many people have an image of the Labour leadership as hard edged and uncompromising. In contrast I have always argued that Labour remains a centre left party that just happens to be led from the left, because the Labour leadership above all else want to change the UK. You can only really change the UK by being in government, which is why we had a populist Labour manifesto in 2017. Once in power you can only make changes that the PLP are happy with because of parliamentary arithmetic. For that reason I have always talked about Labour triangulating over Brexit, and I argued recently that this strategy would require a move to support staying in a customs union. Labour’s move to do just that suggests not only that Labour are triangulating, but also more generally that the Labour leadership are prepared to compromise to achieve power. Remainers that had written Corbyn off need to adjust their view, and realise that stopping Brexit is only possible if Labour supports it. For Lexiters this is a wake up call. There are still too many people in the Labour party that are as prone to brush aside the costs of Brexit as Brexiters are. Some believe, for example, that the argument that with Brexit we would have less tax and therefore less government spending is austerity talk. They are wrong. Fiscal expansions can counteract periods of deficient demand, that may be created by Brexit uncertainty for example, but not slower growth coming from the supply side because of trade destruction. A Labour government having to preside over a slow growth economy is almost sure to disappoint the high expectations that will be placed on it. Even worse are Lexiters who have listened to too much MMT type rhetoric, and think that ‘taxes do not finance spending’ and that therefore slow growth and less taxes put no constraint on what Labour can spend. This is nonsense even in an MMT type world, because trade destruction would mean inflation would become a constraint on spending much more quickly. In the real world where the Bank of England controls inflation, ignoring a lower tax take would result in higher deficits and borrowing which is ruled out by Labour’s very good fiscal credibility rule. Labour will try to stick to this rule, which means government spending will be much tighter after Brexit than without Brexit. Avoiding that outcome has always been implicit in Labour’s ‘economy first’ stance, and what that means has now become more explicit. Labour’s move could start to unravel Brexit. Remainers should not bemoan that Labour has not gone further, but instead focus on building on the elements of reality that Labour have thrown at the Tories Brexit fantasy. For example the emphasis that Labour put on avoiding a hard Irish border requires staying in the single market for goods. If this is helpful for goods, why not services which are the UK’s comparative advantage? We need doctors and nurses from the EU to save our NHS. Each time we take a step further to BINO (Brexit in name only) it becomes clear it is better to have a seat at the table. This is the only way that Brexit can end. The cost to Labour in votes of moving to support a customs union may not be that great, particularly as few voted for Brexit so that the UK could do its own trade deals. As Corbyn said yesterday when asked what he would say to Leavers who had voted Labour and might feel betrayed by his endorsement of a customs union: think it through. I wish politicians would say that more often, particularly for probably the most not thought through policy in the UK’s recent history. UK productivity per hour increased by 0.9% in 2017Q3, and is estimated to have risen by 0.8% in 2017Q4. Numbers like that would not have caused much excitement before the financial crisis, but they sound great compare to what has happened since. However, if you put them in a graph you would quickly put the champagne back in the cellar. As I have suggested before, once you allow for the likelihood that productivity improvements depend on expectations of future demand growth (as you should), this graph is very easy to read. Productivity always falls in a demand led recession (2009) because firms are slow to lay off workers. However once output stops falling (2010,11) firms initially continue to lay off workers and then begin to invest in productivity improvements because they anticipate a recovery, which means we see strong productivity growth. However the UK economy was hit by two big shocks after the financial crisis. First, the economic recovery failed to happen in 2011 or 2012 because of austerity, so firms stopped investing in productivity improvements. That is why there was no productivity growth in 2012 and 2013. However once the recovery of sorts in 2013 looked like it would be sustained, those productivity improvements began to be made, and we saw positive growth in the second half of 2014 and the first half of 2015. But then the second shock happened: the Conservatives won the 2015 election and the possibility of Brexit meant firms put productivity improvements on hold. Does the recent growth at least suggest the Brexit shock is over? It is too soon to come to that conclusion. You would expect growing external demand and a tight labour market to encourage productivity growth, so maybe this is the first sign of that. But in the last two quarters it is a fall in hours rather than a fall in employment that is giving the growth, which may suggest the productivity improvement is temporary. It really is too soon to tell. If my reading of UK productivity growth is correct, and I’m increasingly convinced it is, then the policy implications are dramatic. The austerity mistake did not just give us a temporary hit to demand and incomes, but has led to permanently lower productivity and therefore permanently lower output and incomes. Brexit started reducing productivity, and therefore output and incomes, before the vote even happened (as I suggested it would back in 2013). The costs of governments or voters ignoring what the majority of economists recommend is even greater than we imagined. The first line of defence for the UK’s partisan right wing press (Mail, Sun, Telegraph) is that they do not matter. The opinions they express and the news stories they follow just reflect the views and interests of their readers. We now have clear evidence that this is simply not true for Fox News in the United States. As I describe here, the output of Fox News, which bears very little relationship to the truth, is designed to maximise its persuasive power. I think Obama summed it up quite clearly when he said even he would not vote for himself if he watched Fox News. The presumption must be that the same is true in the UK in terms of the potential power of the right wing press. Most voters are not interested in politics, and so depend on limited sources of information to form their views about politicians and political parties. But I thought we had no comparable econometric or statistical studies to show this for the UK. I had noted that Scottish newspapers were much less pro-Brexit than their English counterparts, but maybe that just reflected different attitudes to Brexit north of the border. I did wonder whether Liverpool and the Sun (more specifically its absence because of Hillsborough) might be what economists call a natural experiment. The Leave vote in Liverpool’s districts does seem exceptionally low (my thanks to Ian Gordon here), but of course there are always other stories you can tell. So we do have evidence, comparable to that for Fox news, of how powerful an influence these papers can have. I suspect the endorsement per se is not doing the work here, but the more favourable editorial line and coverage that went with it. Blair never got the Kinnock or Miliband treatment. It is ironic how much we are currently obsessing about the influence of the new social media, when the problems with old media are likely to be quantitatively larger. Once you acknowledge this, explaining important political developments like public attitudes to austerity becomes much easier (see this paper by Timothy Hicks and Lucy Barnes for example). For so many things that political scientists and others spend a great deal of time analysing, like Brexit, the right wing print media is the elephant in the room. It is in this context that we should view the latest attempt to smear Jeremy Corbyn in the print media, and the shameful attempts by Tory ministers to jump on the bandwagon. (I will leave it to Andrew Neil to explain what nonsense the smear is and who those ministers are, but watch Steve Baker use all the usual tricks (e.g. “questions to answer”) to try and make something out of nothing.) The 2017 election showed us the influence of the Tory press is not total, but May still won: its influence on older voters in particular is still strong. Despite its falling readership, this press still also has considerable influence over the broadcast media's agenda. So when certain journalists call Corbyn’s response to these smears creepy and disturbing, this is the context in which to view such comments. To say it suggests an attack on our free press is nonsense, because the predominantly right wing press in the UK is not in any meaningful sense free. That these papers are owned by extremely wealthy people who can dictate these paper's political agenda seriously distorts democracy. It also means this press has considerable power over the government. The UK press will not be reformed under a Tory government: Leveson 2 has been shelved. Those who want to go back to a world without Brexit and Trump have to ask why Brexit and Trump happened. There is no point treating the symptoms and not the disease. A key part of the reason we have Trump and today's Republican party in the US is Fox News, and a key reason we have Brexit in the UK and ministers calling the leader of the opposition a traitor is the right wing press. Why is the government making such a mess of Brexit? A year and a half after the vote to leave, and the government has still not decided on what form of Brexit it wants. This is despite triggering Article 50, which means we will leave in about a year. If this isn't chaos in government, what is? But why is the UK government making such a mess of Brexit? That is the question addressed by Tony Yates in a New Statesman article. He makes the case that all the problems we are seeing, and in particular the fact that the government have still not yet agreed what they want, come back to the referendum question. Because it did not specify how we would leave, it allowed quite conflicting visions of Brexit to unite. And it is not just a matter of working out which of those visions wins, because the losers may well decide they would rather stay than leave on those terms. Hence the inability, but also the reluctance, of May to spell out exactly what our Brexit plan is. I think there is a lot of truth in that, but it is far from the full story. It might have been possible to have got all those advocating Leave to sign up to a single vision before the referendum. It might not have won, but it could have come close to winning. But that vision would have been based on fantasy: fantasy about the economic consequences of any particular path, and a fantasy about how the EU would respond. Brexiters are not details people. They deal in visions, as Johnson’s recent speech showed. But worse still, they are so attached to their vision that they will not let details (like everyone being 8% poorer as a result) get in the way. A less kind way of saying this is that Brexiters are fantasists or ideologues. Am I being unfair? Just look at what is now happening in relation to the Good Friday Agreement (GFA). The GFA is now in the way of the Brexit vision, so they are all saying the GFA has passed its usefulness. Anyone sane can see such a statement is completely mad and utterly irresponsible. However it also shows us something else. It was clear the moment the government signed up to the first stage agreement that the Irish border issue would to a considerable extent dictate the terms of any final agreement. It has taken the Brexiters this long before they realised this, and started attacking the GFA. They are not details people. You might think that people who would allow their vision or ideology to become more important than details like a 8% GDP loss or peace in Northern Ireland shouldn’t be anywhere near the levers of power, and you would be right. One of the side effects of Brexit is that because May feels she has to have some sort of balance between Leavers and Remainers in her cabinet, we have an even more incompetent Conservative administration than usual. Yet more chaos. Unfortunately, that incompetence is shared by May herself. The number of mistakes she has made is endless. The moment she was elected leader she should have realised that she had to exclude the fantasists from government as much as possible, but instead she gave them key government posts. She drew up red lines that were impossible to negotiate. She invoked Article 50, which instantly put the UK at a tactical disadvantage, without any agreed plan of how to undertake the negotiations. She made all these mistakes because she was afraid that the Brexiters would try and depose her and the press would turn on her the moment she started being realistic. But the point at which she was elected she had the most power (over both Brexiters and the press) she would ever have, and she didn’t use it. That is incompetence. What this all means is everyone is right. Tony is right: the referendum was too vague and put the government in a difficult position. But no government knowingly cuts UK GDP by percentage points unless it is convinced there is some greater danger, and the EU is hardly a danger right now. So even if the referendum had been more precise it would have been a precise fantasy, either about the economic consequences or what the EU would allow. As a result, Brexit was always, and remains, an impossible project for any sane government. But even saying all this, the government has still managed to try doing the impossible in an extremely incompetent way. These different reasons for chaos are all related, and all stem from the disastrous referendum vote. May is Prime Minister because of that vote. Fantasists are at the heart of government because of the vote. And if anyone is tempted, for other reasons, to get on a high horse to talk about press freedom right now, remember the main reason that disastrous vote went the way it did. Social conservatives and the left behind were sold snakeoil, and the main salesmen were the press barons of the right wing press. Below is a chart of the ratio of house prices to rents in the UK and France, from OECD data. That common factor is real interest rates. You can define real interest rates many different ways: here I’m just going to be very lazy and pull data from the World Bank. Again ignore the details (I have no idea about 1995) and focus on the trend. Around 2000, real interest rates started falling, and falling substantially. As real interest rates fall, house prices rise. This will only be true if the housing market is liberalised so that this kind of arbitrage works, and that there are no taxes that stop the arbitrage happening. That was not the case in the UK before the 1980s (mortgages were rationed when I bought my first house), which is just one reason why you would not expect this relationship to hold over that period. But in the last two decades, lower returns on other assets has seen the rise of the middle class landlord as a way of saving for retirement. This substantial fall in real interest rates is a worldwide phenomenon, and it goes by the name of secular stagnation. Why it has happened and to what extent it is permanent is still the subject of lively debate, which is beyond the scope of this post. The key test will be when nominal interest rates begin to rise over the next few years: to what extent do real interest rates rise with them. All I can say for sure is do not rely on those who say house prices always rise over time. Thus the rise in house prices in the UK and France since 2000 has got little to do with a lack of house building, a point that Ian Mulheirn has stressed. But what about rents, which is where we should look for any imbalances in supply and demand. Here is some IFS data from a recent paper by Robert Joyce, Matthew Mitchell and Agnes Norris Keiller. Does secular stagnation (low real interest rates) mean that a whole generation has to rent rather than buy? The main problem is the deposit that first time buyers have to find. Low real interest rates mean a mortgage is easier to service once you have one, although low rates of nominal earnings growth mean that it doesn't get so much easier over time as it used to. But rising prices means rising deposits, which if parents cannot help means saving for a long time. Banks do not want to take the risk of lower deposits, particularly if there is a real chance that house prices could fall. Help to Buy is about the state taking over the risk that Banks will not take, but is that something we collectively want to do? That is the debate we should be having in an age of secular stagnation. Building more houses may or may not be fine, but if real interest rates stay low it is not going to make houses affordable again for the generation that can no longer buy a home. It is fascinating to look at the countries that are similar to the UK and France, and those that are not (like the US and the Netherlands, but especially Germany). If anyone can tell me why these countries have not seen a permanent upward shift in house prices I would love to hear it. But threatening to cut off all government funding is the last thing you should do. The message that sends to other charities is to hide any similar problems they come across in their own work, or worse still stop looking. Any responsible minister would have known that, but perhaps they wanted to get political points from their own side for being tough with a ‘leftie charity’. In none of the BBC coverage I saw (this story was the lead item on the BBC news I watched for four days running) were any questions raised about the government’s actions. Contrast the behaviour of politicians and the media in relation to what is currently happening in the NHS. Quite simply people are dying because there are insufficient resources to cope with needs. Thousands have had operations postponed, leaving them in pain. Patients are lying in trolleys because there are not enough beds. Huge numbers, more than ever before, are having to wait for more than four hours in A&E. The reason for all this is not mysterious. Health has been starved of resources by this and the previous coalition government like never before. I have shown the Kings Fund analysis in the past. 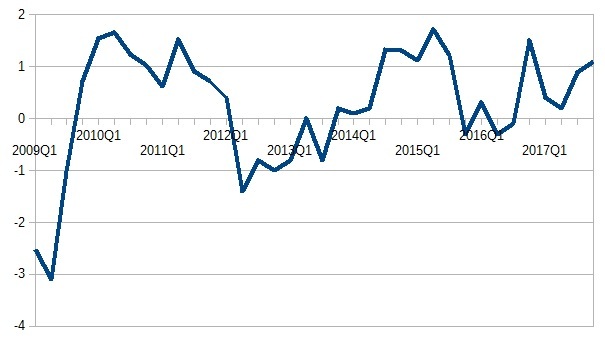 Here is World Bank data up to 2014. The key point is that health spending as a share of GDP needs to rise to keep up with demand, but since 2010 the government has been shrinking the share of total output spent on health. The downward trend it shows until 2014 has continued and is projected to continue. This shows neglect on a scale that make the leadership of Oxfam’s misdeeds look trivial. Yet where is the media scandal? The man who has been in charge of the NHS while this has happened and is happening in front of our noses is still in his job. The government continues to fail to provide the resources the NHS needs, while promising to protect the NHS, and yet it has not been held to account for killing people and leaving them in pain by the same media that has been happy to pursue the leadership of Oxfam. The Minister for International Development told the leaders of Oxfam that “an organisation’s moral leadership comes from individuals taking responsibility for their actions”. Quite. The government are in denial about what is happening, and the media allow them to get away with it. Of course there have been countless reports about the crisis in the NHS, but we have not seen the kind of sustained and coordinated media focus on who is responsible that we saw with Oxfam. This is not about sexual exploitation in another country some years ago, but about people dying and in pain right here right now. And incredibly, it is actually worse than this. The same politicians have attempted to use immigrants as a scapegoat for what is happening, whereas in fact immigrants provide more resources that could be used for health spending than they take out. Yet time and time again ministers can get away with this lie in the broadcast media. Worse still, one part of the government is busy preventing doctors the NHS desperately needs from coming to work here. And finally, I have never heard anyone in the broadcast media question why the government is starving the NHS of resources with such devastating effects. Its silence on the growing privatisation of NHS services is almost total, even though the vast majority of people do not want this. This reminds me of the US election, where the media spent far too much time going on about Clinton’s emails and far too little time on Trump’s obvious unfitness to be a POTUS. But in this case there is no competing narrative, no two sides to balance. The media is simply failing to hold the government to account for allowing totally avoidable death and pain. This is what the UK has become in just seven years. A country that is happy to treat those who run charities as close to criminals, but shrugs its collective shoulders while the government destroys the NHS in front of our eyes. If you think from the title that this post will argue that the poor showing of Labour in the polls means it must change course on Brexit I’m afraid I will disappoint you. Unfortunately I am not at all surprised that Labour’s lead in the polls that it achieved after the election has now all but disappeared. It is certainly true that for anyone who takes an active interest in politics the performance of this government has been as bad as you can get, but most people do not take an active interest. Instead their view is guided by a media environment which aims (actively or passively) to show a very different picture. This is increasingly true as the BBC becomes little more than a mouthpiece for the press. I am sure Labour could do better at handling this naturally antagonistic environment, but to put this all at the door of Corbyn or Brexit misses the bigger picture. The lesson of the Labour surge during the 2017 election is that once the party gets direct access to voters they like what they see. Once the media filter goes back on, voters see a very different picture. This is the lesson of 2017 that hardly anyone in the media wants to admit. For that reason, as I have also emphasised, a party that triangulates has to be very careful to always appear to lean away from their opponents side in the direction of their supporters. In the case of Brexit, that means appearing significantly less pro-Brexit than the government. Polls suggest that was achieved during the 2017 election, but that was still in a period where the parties talked in generalities. Since then things have inevitably become more concrete, with the issue of the moment being the Customs Union. The position of the two parties after transition remains different: May is committed to leaving the Customs Union, whereas Labour say everything is on the table. However sometimes Labour’s position looks as much cake and eat it as their opponents. Sometime this month Labour will discuss its strategy over Brexit. The danger of its current position is clear. Theresa May is going at some point be forced to admit that we will stay in some form of customs union with the EU because of the Irish border issue. The only alternative is to leave with no deal, or dump the DUP. Whichever occurs, Labour’s non-position on the Customs Union will look bad. If she goes for a deal Labour will be the wrong side of the government in terms of triangulation, which will be fatal to its support. If she goes for No Deal because of the Customs Union Labour will be immediately asked what it would do. Deciding to stay in the Customs Union just at the point when the issue becomes critical will look like the political opportunism that it is. Given that, there is a clear advantage from coming off the fence sooner rather than later. The benefit of declaring to be in favour of staying in the customs union is that they will, once more, create clear distance between their own position and the government. The Conservatives will of course claim that in doing so Labour are no longer supporting the ‘will of the people’, but I doubt that will resonate. People did not vote Leave in the referendum in order to make separate trade deals with other countries. Any voters that do desert Labour on this issue will come back pretty quickly as May is forced to face reality. The government’s own analysis, which Labour should use, suggests deals with non-EU countries cannot make up for the impact of leaving the Customs Union. Above all else, it is very difficult to see why Labour would ever want to leave the Customs Union, given that doing so would do so much harm to its traditional electoral base. We could add that talking about “right populists” and “left populists” allows the academic to show a kind of balance. The problem I have with definitions like this is that they seem to be encompassing rather than natural. By this I mean that it includes things that do not obviously go together, but instead are chosen so that they encompass some list of political parties. Virtually every candidate for Congress in the US declares that they will ‘sort out Washington’, so appears anti-establishment and for the people rather than elites. In contrast, authoritarian governance is optional. What seems to be doing the work here is opposition to liberal economics and globalisation. Thinking in terms of left or right tends to get in the way here. The more appropriate axis to thinking about this definition of populism is social liberalism and conservatism. A social liberal, almost by definition, is not going to attack democratic pluralism. Once we recognise that, we can see why parties of the right that use socially conservative policies to attract votes are particularly vulnerable to morphing into (or being taken over by) populists in the Müller sense. Indeed this is a point he himself makes, as I quote here. It seems to me that Brexit can illustrate both types of populism. The definition of populism based on anti-globalisation might describe quite well the average Leave voter. The Leave voter tends to be against immigration, and as a result be prepared to roll back globalisation, and this often goes with a belief that the elite or establishment no longer listens to them. In contrast some of the prominent Brexiters, and certainly the newspapers that swung the referendum vote, are populists in Müller’s sense. They are quite happy to talk about the will of the people, and take away power from judges and parliament to ensure the will of the people as they see it prevails. This is why I have considerable sympathy with the Hungarian academic who I quoted at the start of this post. Populists in the anti-globalisation sense may be a problem, depending on your view of globalisation and liberal economics, but they are not really dangerous for democracy. Populists of the kind Müller describes are, as our history tells us. In the US, we are not just talking about Trump, but most of the Republican party: a party that appears to go to any length to preserve its gerrymandering of voting districts. In Hungary and Poland we have seen many attacks on pluralistic democracy justified by nationalism and racism. Both, like Russia or the far right in the US, are happy to scapegoat someone who happens to be a wealthy Jew as an enemy of the people for the crime of standing up for liberalism. That certain UK newspapers find common cause with these authoritarian regimes and the far right in the US by scapegoating the same wealthy Jew on their front pages should be a wake-up call that these newspapers are no longer part of a pluralist democracy but have become instead its enemy. Tear down rather than reform. Of course when reform becomes destroy has to be judged, but in most cases that is not very difficult. I last talked about this question from the British Social Attitudes survey in 2014. Here is the latest version of this longstanding survey question (source and exact question here). A point I made in the last post was that the percentage of people wanting lower taxes and less spending has always been less than 10%. If you believe the survey, and I see no reason not to, there has since 1983 been no public appetite for reducing government spending in order to cut taxes. All the action over time is between those who want things to stay as they are, and those who want higher spending and taxes. As public spending has been cut in recent years, so the number of people wanting more spending and higher taxes has increased. However that proportion is still not up to the level it was in the 1990s. Does this survey suggest that half the population want a larger state, and hardly anyone wants a smaller state? That depends on what you mean by the state. The question actually asks about spending on “health, education and social benefits”, so it seems reasonable that this is what people are responding to. They are taking as given that the government in the UK provides these things, and are simply expressing their view about whether they want more of these goods and are prepared to pay for them. The question does not ask about whether these goods should be produced by the state or by private contractors working for the state. 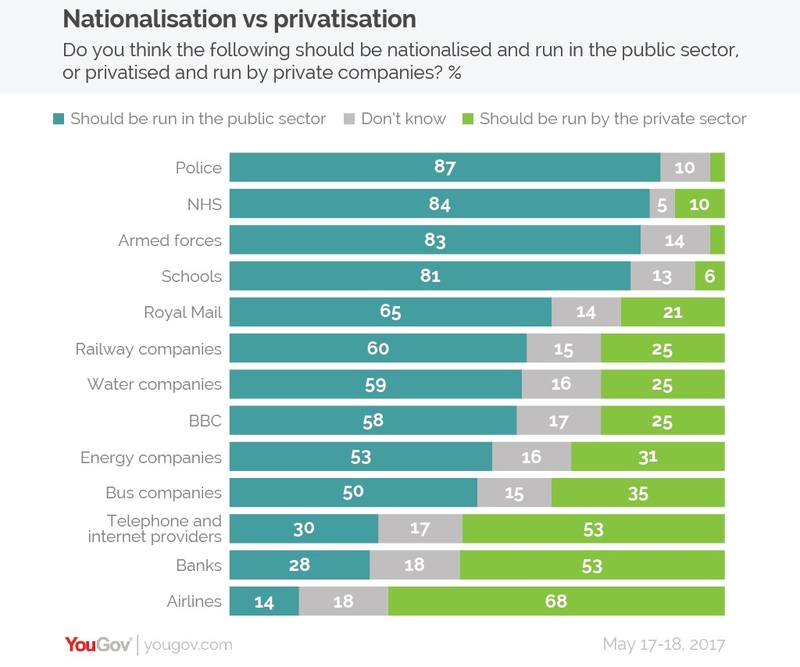 These numbers are from last year, so the collapse of Carillion and the problems with the East Coast rail line are likely to push public opinion even further away from the privatisation ideal. Note that only about 10% want privatisation of the NHS, which has continued rapidly under this government. A government that reduces government spending and taxes, and pushes privatisation of the NHS, seems like a government of the few and not the many. I remember being told how nervous the last Labour government was when they decided to raise NIC rates to fund an increase in NHS spending. They had committed to not raising the basic rate of income tax in order (they thought) to be able to win elections. Given the data above, you might wonder why. But then I remembered how the Labour PLP had decided that they had lost the 2015 election by being too left wing, again without any real evidence. Perhaps the lesson of these two poll results is that the gap between what people actually want and the received wisdom of the Westminster bubble is very large. Does the financial crisis reveal that economists are at the leeches and mercury stage of their subject, and as a result policy makers and the public have every right to ignore what they say? Does the fact that economists working in finance failed to recognise the prospect of a systemic crisis, and that macroeconomists both took finance for granted and as a result failed to investigate financial-real links, mean that we should ignore what economists say when it comes to Brexit? Speaking for my own subject, I think the financial crisis does raise serious questions about the methodology macroeconomists rely on, as I have explained at length elsewhere. But does it mean that everything macroeconomists have learnt in the last 80 years is virtually worthless, or at least no better than the opinion of the average politician? Why don’t we look at what has happened since the financial crisis. Macroeconomists, having learnt the lessons of the 1930s, immediately recommended that policy makers do three things after the crisis: cut interest rates sharply, embark on fiscal stimulus and bailout banks. Policy makers took that advice in 2009, and as a result we avoided another Great Depression. Many said that rising government debt was sure to send interest rates on that debt rising: academic economists using basic ideas from Keynes said they would not and they were proved right. Many others said that Quantitative Easing (central banks creating money to buy government debt) would cause hyperinflation, but again academic economists looking at more modern New Keynesian models said that was nonsense and again they were right. You might claim that in all this economists were just advocating what was obvious. The acid test came in and after 2010, when fiscal stimulus turned to austerity. What evidence we have suggests this move was opposed by a majority of academic economists, a majority that grew over time. There was a minority that supported austerity, at least for a time, and they gained a lot of publicity because politicians latched on to what they had to say. But the majority followed both textbook and state of art economics, and this majority was right. The recovery would have been stronger and faster if politicians had gone with this majority. If we look back before the financial crisis at UK macro policy, we can again look at the record of economics compared to politicians. The obvious place to start is with the 364 economists, who despite all attempts by politicians and think tanks to suggest otherwise were right: tight fiscal policy in the 1981 budget delayed a proper recovery by over a year. We can look at the following recession in the early 1990s. A key driver behind that was the UK joining the ERM at far too strong an exchange rate. Here it gets personal. With colleagues at the National Institute I undertook what was acknowledged at the time to be the most comprehensive analysis of the appropriate entry exchange rate, and we argued that our entering at the then current rate was folly. We were ignored, and as a result the UK was the first to be kicked out of the ERM in 1992. The next time the UK had to decide to join in this case the ultimate fixed exchange rate regime, the Euro in 2003, it was the economics that persuaded the Labour government not to join. In this case macroeconomic analysis played a critical role in making the right decision. The other key thing to say is that the discussion above has virtually nothing to do with the long term impact of Brexit, which depends on international trade. The key bit of analysis that means trade with the EU cannot be simply replaced with trade elsewhere are gravity equations. Gravity equations do not come from theory but from the data: countries are much more likely, even today, to trade with near neighbours than far away countries after allowing for other factors. So when Rees-Mogg suggests that the Treasury must have fiddled the numbers, when the government’s analysis confirms those of other studies that Brexit will be costly for all of us, we know he is slandering civil servants for his own political gain. That he is also the favorite to replace May as leader of the Conservative party tells you all you need to know about the current mess the UK is in and why it is in this mess. Of course we do not condemn engineering science when a new bridge wobbles or an oil rig fails, and we do not say that all medical science is nonsense when medics get things wrong, as they frequently do. But with economics, there are too many people who either want to replace the mainstream with their own school, or who like Rees-Mogg want to discredit economics because they suggest his preferred policy is harmful. As a result, whenever economics does make mistakes, as it will, there will be plenty of people around who want to bury the whole discipline. But when you look at all the evidence and not just one observation, as economists are trained to do, you find that you are better off following the advice of academic economists when it comes to economic policy than anyone else. The argument that academic economists should be modest or humble when giving their views should be seen in this light. They should certainly be honest about their own views compared to their colleagues, and they should also if they are given the opportunity express the uncertainties. But being modest and humble should never mean leaving politicians unchallenged when they proclaim economic nonsense.